- including covers and a plethora of star scans, but not including his prodigious output on the Daily Star Dredd strip, which he worked on almost exclusively for years. Who needs three panels to tell a joke? Motion; stupid people; helmets that can frown; controlled chaos; sound effects; mad detail. Generally injecting all his work with a tone of unbridled, gleeful lunacy. 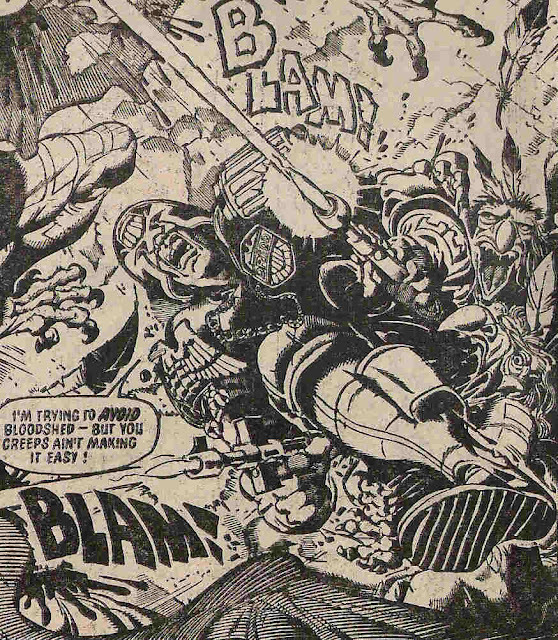 Ron Smith was one of just a handful of regular artists on Dredd from Prog 105-499, and more than earned his stripe as the man tapped to draw Dredd for weekly, then daily publication in the Daily Star Strip. And, for the record, he has drawn more Judge Dredd stories than anyone else! 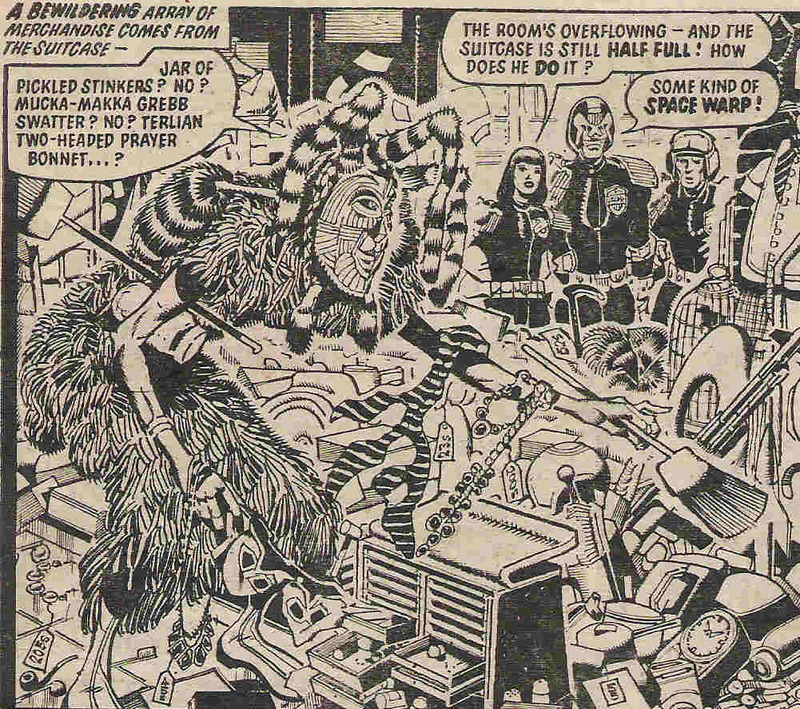 However, it seems he’s something of a divisive artist, fondly remembered for his work on a lot of the funniest Judge Dredd stories, but perhaps less fondly remembered and name-checked than the likes of Bolland or McMahon, to name just two examples. It’s certainly true that Smith has a very different style to these greats, and unlike those two, very few, if any, 2000 AD artists have attempted to borrow Smith’s distinctive look (Steve Roberts or Boo Cook, a tiny bit, maybe?). So what’s different about it? It could be that he doesn’t have as many big iconic panels as those two. He doesn’t go in for chunks of black, so although he drew his fair share of dramatic poses, Smith’s figures don’t tend to stand out in the way of a Bolland panel. What makes a panel iconic and memorable? What he does go in for is hyper-kinetic poses showing people not just in mid-action, but in the weirdest possible frame within that action. Some of his poses end up fairly alarming in isolation, but by golly they make the action zip across the page. You can tell he has a background in animation. Another great Smith trick is the effort he puts into the faces, hair and clothing on the smallest side character. When I think of Mega City 1 citizens, it’s Ron Smith all the way. And although Judge Dredd is as replete with short, funny one-offs now as it ever has been, there’ll always be something special about Smith’s work. That last juve cracks me up every time. He wants to try his first umpty so bad. who can'tcope with Walter's Dredd obsession. Plus, he did The Graveyard Shift, everyone’s favourite micro-epic. *** And it’s important to point out that he was a key player in many of the more poignant Dredd stories, including Unamerican Graffiti, in which young Chopper is maybe the first perp to sort of get the better of Dredd. See also Portrait of a Politician, which lends pathos to an orangutan, and most especially the trifecta of A Question of Judgement / Error of Judgement / A Case for Treatment. This little trio were, I think the first steps that took Dredd on the path of doubting the system, a background plotline that has grown and grown over the years. It also involves the Monty-Pythonesque delight of a hilariously crippled child. He seemed to be an artists who’d attack every script he was given with verve and brio, no matter how insane the panel descriptions. It’s true no one could have improved upon Ezquerra’s Strontium Dog or Gibson’s Robo Hunter, but I can’t help but think Ron Smith could have designed the heck out of some crazy mutants and robots, had he been called upon to do so. And his vision of Downlode would have been a delight, I’ll bet. But, as it happened, Smith was exclusive on Dredd for most of his career. Instead, when he returned to the Prog in the early 90s with a somewhat refined style, Ron Smith ended up doing his level best to liven up some frankly pedestrian scripts. Survivor, the Mean Team spin-off no one was clammering for***, asked Ron ‘crazy humans’ Smith to draw a panther, and not a team of weird-looking future sports players. Still, he got some interesting page layouts in there. Chronos Carnival, something of a by-word for rubbish stories, is actually far better (than Survivor; not saying much…) and a good use of Smith’s talents. If it had a problem, it’s that it belonged in Tornado or Tiger or even today’s Phoenix - a proper children’s adventure comic, essentially. The two human leads were fairly dry by Smith’s standards, but at least he got to litter the background with the frantic daily goings-on of a carnival. He also got to play with dragon-looking aliens, and still give them the Ron Smith facial expression treatment. And, every now and then, he livened up a number of mid-period Future Shocks - the sort of stories that can be made so much better with a decent artist. It's a metaphor for the fear of old age. Maybe. 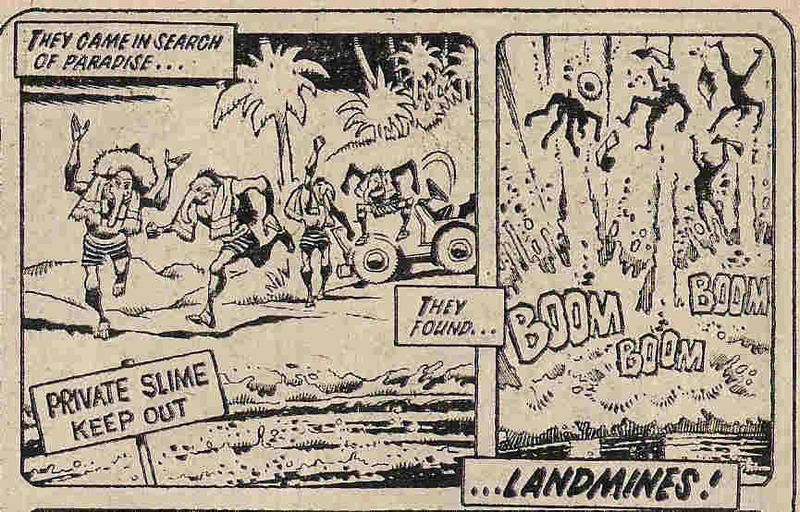 A far less good use of Smith’s talents was as the new Rogue Trooper artist. 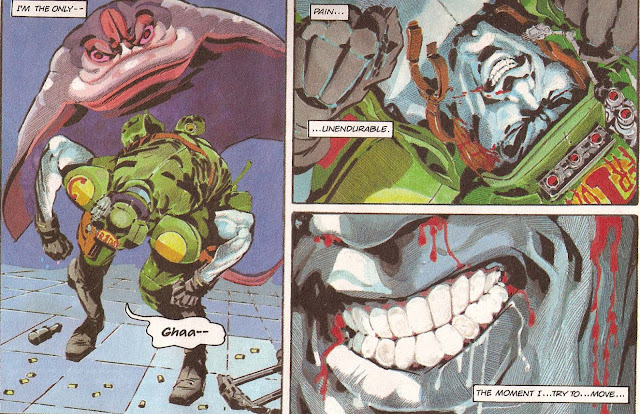 The character had just been made over as an uber-serious, deeply sombre figure dubbed ‘the War Machine’, with overlty adult painted art by Will Simpson. Ron Smith is about as far as you can go in the opposite direction. It ended up making some sense because the scripts for this new iteration of Rogue Trooper were written by Micahel Fleisher, who either hadn’t read or didn’t get the point of the War Machine, instead writing a children’s action comic. ‘The Golden Fox Rebellion’ is pretty poor. ‘Apocalypse Dreadnought’, a later series set mostly in a PoW camp, was actually much better, but still an odd fit for Smith. As a reward, he was put back on Dredd, after a long absence. 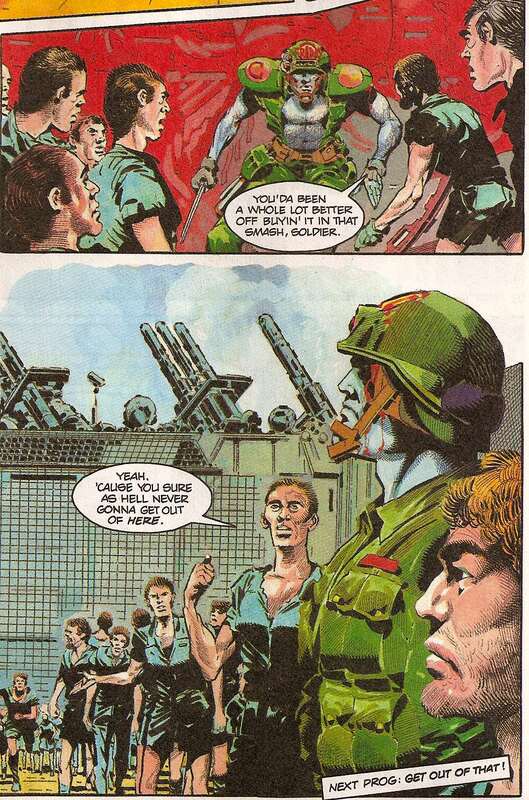 But he ended up working on, mostly, the overtly silly ones, often scripted by Mark Millar or ‘Sydney Falco’. I get the impression he’d said all he wanted to say with Judge Dredd and at this point was sort of going through the motions. Still, the anarchy inherent in his work prevailed, and his ultra-cartoony style was at least a match for Mark Millar’s predilection for jokes that don’t work in a real-world setting. Judge Death - not his finest hour, but still scary. So fast you can outrun a Judge with a gun? Really? But points for the rendering of the gag. 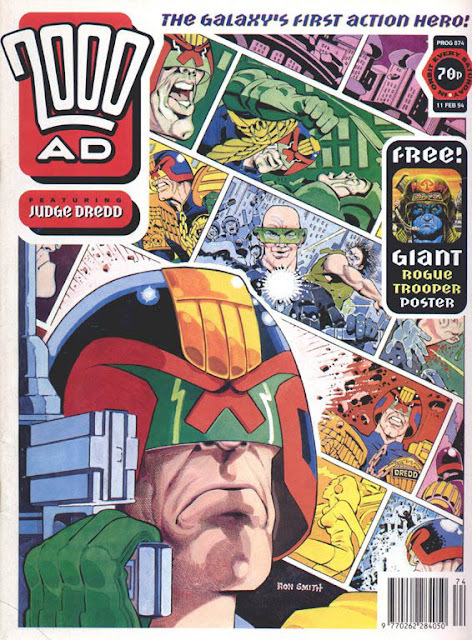 Smith had already enjoyed a long career in British comics before 2000 AD came along, but his Dredd work is a crowning achievement both for himself, and for the comic. I can't end without giving praise to Smith's signature Dredd look - the frowning helmet! *Smith drew ‘Unamerican Graffiti’, the Judge Dredd episode in which the young Chopper first appeared as a wall-scrawler. His look was significantly redesigned by Cam Kennedy for ‘Midnight Surfer’, and arguably again by Colin MacNeil for ‘Song of the Surfer’. Nonetheless, original credit where it is due! **That’s the general term for Dredd stories that are more than 5 but less than 15 episodes long, right? ***Actually, 11 year-old me was a huge Mean Team fan and was terribly excited when this appeared out of the blue. I was happy to see Henry Moon again, but all around the decision to commission this actual story was a head-scratcher.